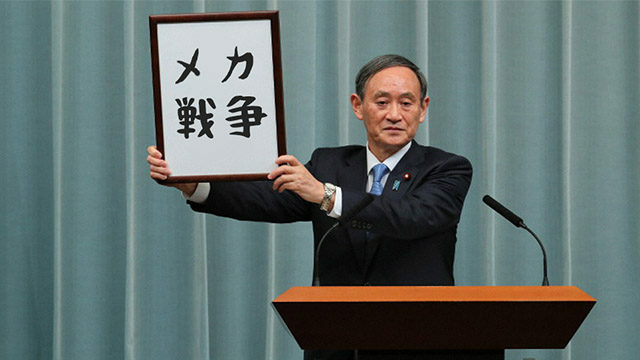 TOKYO, Japan – Japan revealed that the new era name to begin with their new emperor will be “メカ 戦争,” pronounced as “Mecha Sensō”, which means “mecha war”, in a press conference led by Yoshihide Suga, current Chief Cabinet Secretary. This will replace the current “Heisei” era which translated to “achieving peace”. News analysts worldwide have discussed what kind of impact this new era name could have, but Anime Maru instead reached out for comment to people with anime avatars on Twitter for a more insightful perspective. Other Twitter users expressed concerns over the impact this new era could have on world politics. Some have asserted that the new era name is a cover for increased Japanese militarism. Prime minister Shinzo Abe was asked to comment on concerns at a press conference. “Just focus on the cool mech part. We all love mechs don’t we?” stated Prime Minister Abe before brushing off reporters. The Japanese government revealed that the runner up for era name was ファンサービス, which translates to “fanservice” but decided against the name after determining that it would be better to focus on such a value indefinitely rather than limit it to just one era.